Simon Caldwell recently published an inspiring account of elderly Iraqi Christians in the village of Karamless. (See: Elderly Iraqi Christians defy terrorists, flee to camp H/T Transalpine Redemptorists) When the IS terrorists overran Karamless, on the night of 6-7 August, everyone fled except the elderly who were too weak to run. 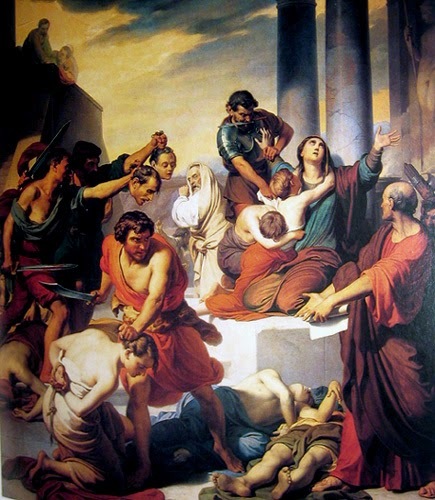 The masked terrorists demanded that they convert or be killed by the sword. All of the elderly people said "we prefer to be killed rather than convert." In the event they were ordered to leave the village with only the clothes they were wearing. 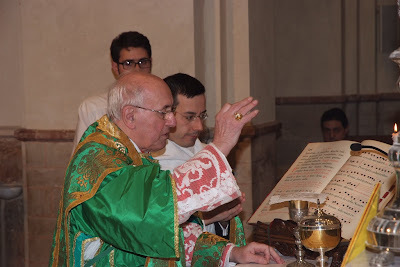 Fr Hunwicke's Mutual Enrichment is not a blog that can be usefully skim-read. His articles are not long, but they repay more close attention than those of the "5 reasons why Pope Francis didn't really say what everyone thinks he said" genre. When I find time, as I have just now, I read a number of his posts in sequence. It is always a rewarding experience for me, especially since quite often he tackles something that I have wanted to say but not found the time, and writes on it with erudition and wit. During the past week, we have had, among other things, a discussion on whether Muslims and Christians worship the same God, a gently provocative piece on the lack of Latin among the clergy, and an important post arguing for baptism sub conditione for Anglican converts whose only evidence of Baptism is a certificate. 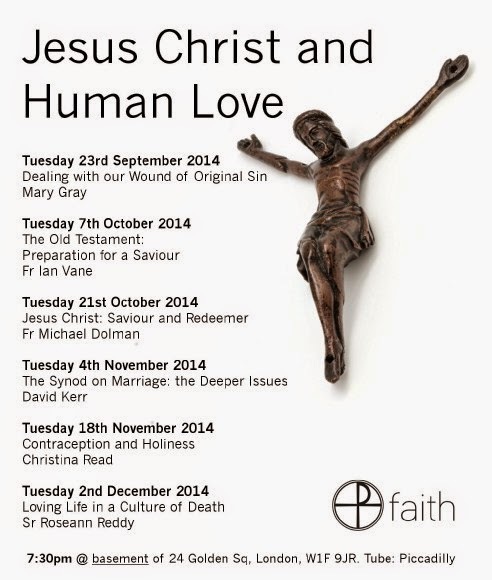 The Faith Movement organises Evenings of Faith in London, a series of talks by orthodox Catholic speakers, addressing questions of faith and morals. As you can see from the above poster, this season promises some fine lectures. These evenings are not age-restricted and are open to all. They are held in the basement of the church of Our Lady of the Assumption in Soho by kind permission of the Ordinariate of Our Lady of Walsingham. Don't forget to have a look at the current issue of Faith Magazine which you can read online or download free. Annual subscription to the hard copy magazine is £25. Holy Communion is often treated as a prize, nowadays, or even a "right." The July-August issue of Faith Magazine carries an article of mine, looking at the dispositions required for Holy Communion: living in accord with the teaching of the Church, being in a state of grace and free of unconfessed mortal sin, and making a proper spiritual preparation for Holy Communion. In this connection I also discuss the danger of routine communions. Bishop Mark Davies kindly recommended the article when he visited the Faith Summer Session earlier this month. Catholic Dilemma 285: Is Confirmation the point when we become Catholic? Is it correct that when we are Baptised into the Catholic Church we become members of the Christian Faith, and even though we may make our First Holy Communion we don’t actually become full members of the Catholic Church until we receive the Sacrament of Confirmation? By Baptism we are incorporated into the Church and become members of the body of Christ. There is only one Church, founded by Our Lord on the rock which is Peter. In a case of genuine necessity, anyone, even a pagan, can baptise validly, as long as they use water, say “I baptise you in the name of the Father and of the Son and of the Holy Spirit”, and intend to do what the Church does. Any person who is thus baptised becomes a member of the Catholic Church.